Twitter is a free utility that connects its users through very small instant status messages. Other members can view these status messages on Twitter website, IM chat windows, desktop, Internet applications and SMS. Twitter recently withdrawn the SMS and IM based status update service due to some data server issues. 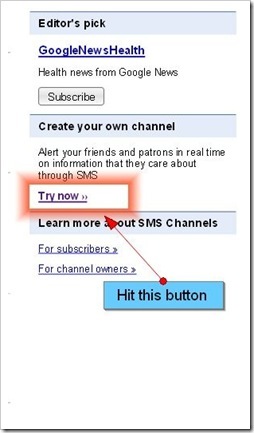 However, now you can continue to receive Twitter updates by SMS using the method given below. Unfortunately Twitter free SMS status updates are only available to people from India. Start a Google SMS channel using your Google account here. Just name your SMS channel and give a description. In the next step, the desired persons twitter feed in the feed section in Google SMS channel registration page, as shown above. And once the user updates the feed gets updated and it triggers Google SMS channel. Tweet SMS delivery may delay, and it depends on the traffic load on Google servers. You can receive a maximum of 50 updates/tweets per day. PLease help me to get my certificate and key. I've really lost hope.